Bizarro is brought to you today byFriends Don't Let Friends Drive Headless. I used a bit of artistic license on the rest of the memory depicted above in that it was another six years before the fish in our aquarium devised a way to land on the living room carpet, but to be honest, it was no less impressive. If you’ve never seen Roman Polanski's Rosemary’s Baby, point your peepers at it sometime soon if only to see what passed for scary in 1968. It’s deliciously corny and reminds me a lot of that time my cousin got pregnant by the devil. What a kerfuffle that caused with the family! In an effort to hide their shame from their community, the baby was born at home and I can testify that oven mitts were, in fact, needed. Before I figured out how to make a living as an artist, I had a few office jobs and all of them caused me to fantasize about falling down an elevator shaft. In all of those fantasies, I would hang onto the boss and use him/her to cushion my fall. My dog tried this same trick on me but the truth is, the logic is backward. If humans live seven years to every one year a dog lives, the human should get seven minutes to every one minute the dog gets. Make no mistake; dogs will cheat at board games. I don’t blame this guy; laws and courtrooms are really confusing and I never know what to wear, either. I usually just wear an orange jumpsuit to be sure I'll get one that fits if I'm convicted. 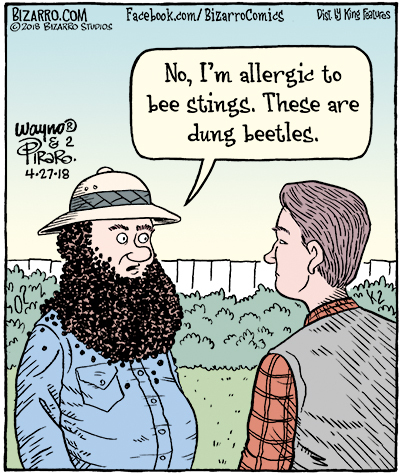 According to the periodical Apiculturists Weekly, Wayno has done more “bee beard” cartoons than any other cartoonist. 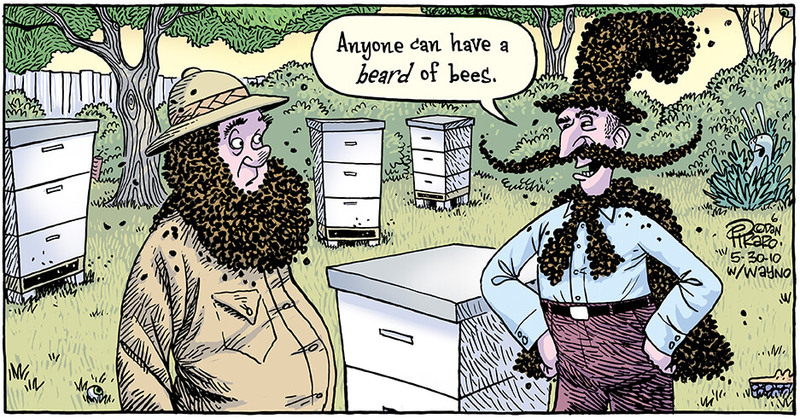 Although this one only LOOKS like a cartoon about a beard of bees, so does it qualify? Below is one that Wayno wrote and I drew way back in old-timey times. Lastly, has there ever been a band called The Dung Beatles?